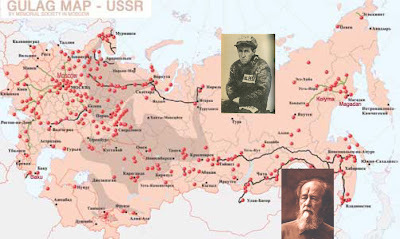 Gulag - the "Glavnoe Upravlenie Ispravitel-no-trudovykh Lagerei" a.k.a the Chief Directorate of Prison Camps (in the former Soviet Union) - a word that became widely known in the West partly as a result of Solzhenitsyn's writings e.g. One Day in the Life of Ivan Denisovich, The Gulag Archipelago", etc. Solzhenitsyn passed away this week at the age of 89. Expelled from the Soviet Union in 1974 (after winning the Nobel prize for literature in 1970), he moved to the United States. Initially feted, he fell out of favor when it turned out he was a staunch Russian nationalist, supporter of Russian Orthodox church, and fiercely critical of western "decadence." Many in the United States no doubt could not understand why he did not see the superiority of the capitalist system (most Americans, born and bred on American exceptionalism can not understand why foreigners don't love us... something you see reflected in Iraq and the broader Middle East on a regular basis!). Solzhenitsyn returned to Russia in 1994, but never really regained the stature that he once had, history and the times had passed him by.